The moment a student begins the martial journey, he or she receives a uniform and a white belt. It is a special moment, and you can see it on the student’s face. This sets the foundation for the entire martial journey. Here are just a few reasons why. 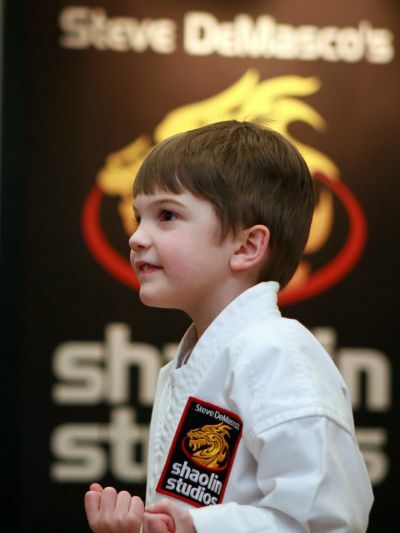 The uniform demonstrates a student’s commitment to the martial journey. People who learn commitment at an early age are better able to persevere when life gets difficult. High school, college, graduate school, and a career all require commitment. So do relationships, friendships, and parenthood. Those who remain committed to their values, to the people in their lives, and to a career path, tend to live longer, happier, healthier lives. Teaching your child about commitment sets the foundation for success. When a child wears their uniform, they see, hear, and feel that this space is different. The student gets the message, “I am here for a special reason. This isn’t like my other activities.” Every student of the martial arts, from Grandmaster DeMasco to the newest white belt, bows on the way into the dojo. Similarly, everyone wears a uniform. It builds a foundation for a student to accomplish things they can’t accomplish anywhere else. Uniforms are just a smart idea. We move, jump, run, tumble, fall, grab, strike, block, and roll around in Kung Fu. Grandmaster hand-selected this uniform to stand up to the rigors of martial training. Lapels and seams have multiple stitching. The 7 oz. material is light enough for comfort, but strong enough to withstand being grabbed, rolling around, or kicking over the head. While the uniform represents important martial values, it is also excellent workout gear. In our studios, students are allowed to wear the school t-shirt to a regular workout, as an alternative uniform. They must still wear their belt and uniform pants, and martial shoes are still encouraged. Students must still wear the regular uniform jacket to formal events, such as belt advancement, tournaments, and special classes with SDSS Masters. Many parents are not aware that wearing other t-shirts to class is an outward sign of disrespect. Kung Fu parents understand the value of the martial arts, and would never send a child to class wearing street clothes. Life can be very hectic at times, and important messages can get lost if we don’t highlight them. Sending a child to class without a uniform confuses a child. It undermines the important life lessons that brought us here in the first place. When you insist your child wears their uniform, you send a message that you love them, that you support their learning, and that your child can do anything they set their mind to.